We all know that a multivitamin does the body good but, let’s be honest, who really remembers to take one every day? Well now staying on top of your health has become more rewarding than ever. 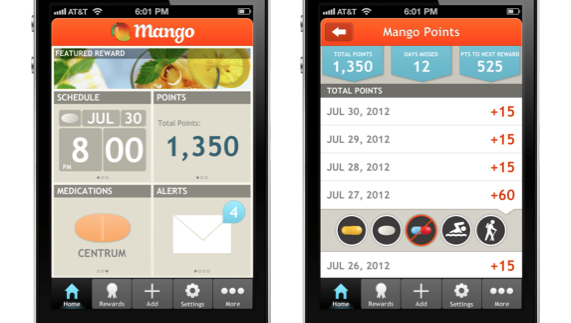 San Francisco startup Mango Health is set to spend 1.45 million to launch a new line of mobile health apps that will engage users with gamification principles. The company’s first app, which is currently in beta, is designed to help users remember to take supplements and medications. Users that stick to their schedule are rewarded with discounts or prizes, and can even compare their personal progress to others on the same medication. Prescriptions are entered into a personal log by uploading a picture of the bottle, and daily reminders help users stay on track. The masterminds behind this new project, Jason Oberfest and Gerald Cheong, are both former mobile gaming execs, and recognize the powerful effect that introducing incentives can have on improving healthcare. Mango Health plans to take advantage of the exploding mobile health market with a full range of gamified apps, each with the goal to make the world a healthier place- one prize at a time!